Could you be stuck with the dilemma of selecting the best propane water heater? Then, relax and fret not, for you are at the right site. We are here to ensure that you get the best tankless water heater for any of your properties and also get value for your money. Our team of professionals has spent days analyzing the products in this category. As a result, we managed to select the top 5 best propane tankless water heaters. Here is a detailed, unbiased and independent review of these water heaters. Read on! It’s true that your home or workplace demands hot water for various applications. If you’re looking for a silent indoor water heater, Takagi T-KJr2-IN-LP is yours. The sweet spot with this Takagi T-KJr2-IN-LP is that it demands minimal maintenance. Let’s get to see what it has to offer. First, this unit demands a power input of up to 140000 BTUs per hour. Again, its flow rate rating is practical. It can provide hot water with temperatures above 150F. Again, this unit can produce up to 6.6 gallons every minute for those dwelling in the moderate climates. This means it can support various hot water applications at the same time hassle free. But, for colder regions, the flow rate might drop to 3 -5 GPM. For more convenience, this unit can integrate with a remote controller. Thus, setting your preferred water temperature should be as easy as pie. The remote controller comes with the purchased package. Even more, this unit’s compact nature is also a selling point. We love its lightweight nature as it weighs only 38 pounds. Most propane powered tankless water heaters are vast and heavy. The Takagi T-KJr2-IN-LP Tankless Water Heater is different. It measures 6.7 * 13.8 * 20.3 inches. Thus, you can now enjoy propane power without compromising your space-saving goals. As we all know, propane tankless water heaters perform way much better than the natural gas ones. Also, you will need high-quality stainless steel vents to tackle the released fumes. There is nothing to complain about the performance of this unit. Also, it’s critical to note that this is a “point of use” unit and not “whole house”. So for those with large homes, you may need to buy more than one of this unit. One can’t serve several bathrooms at the same time. Its installation is as easy as pie. Various tools are necessary for the proper installation of the T-KJr2-IN-LP. You’ll need a-110 electrical outlet and circulation pump. You’ll also need category 3 vent kit and ground lines. It’s advisable to have a certified technician install it to avoid disappointments. Finally, requires a ventilation system to release the harmful fumes. This also results in extra installation costs. 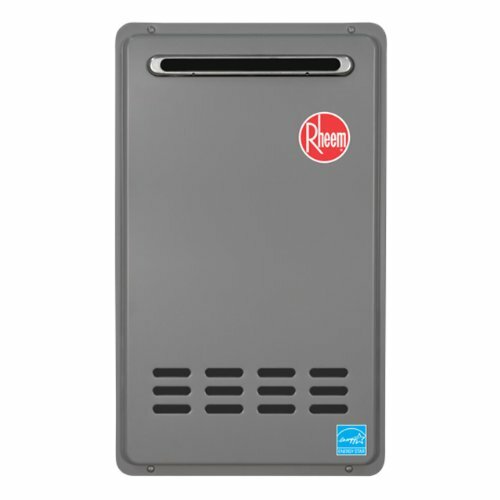 Among the best propane tankless water heaters is the Rheem RTG-64XLP. It’s a propane appliance that stands out in many ways, as we are going to see below. Let’s take a closer view of its features and specification before you place your judgment. Rheem RTG-64XLP is a powerful unit. It’s its excellent design and engineering that buy it a slot in this category. It works with a small power input of 150,000 BTUs. RTG-64XLP can provide hot water with temperatures up to 180F. It also has incredible performance that makes it a worthy investment. We also appreciate its compact and lightweight nature. The Rheem RTG-64XLP measures 14*10*26 inches. With its compact design, you can install this unit anywhere. Your limited space is no longer a hindrance to enjoying a ready supply of hot water. Also, this unit weighs only 38 pounds. So, transporting and installing it should be as easy as pie. Again, its low NOx emission guarantee is one of its primary selling points. You will pose no danger to yourself or the environment with the use of the Rheem RTG-64XLP. Thanks to its superior construction design, this unit releases less gas. In fact, its effect is negligible compared to its competitors. But, the manufacturer advises you to install it outdoors. This is because the fumes released are a risk to your family’s health. Luckily, there are no extra accessories required for outdoor installation. Some of the tools required for installation include valves, ground lines, and vents. Pipe cover, amp breaker, and a water heater connector. Within the purchased package are a 10-foot thermostat and a remote controller. Rheem Technicians are also available to help with the installation. The Rheem RTG-64XLP propane tankless water heater delivers its promises. It’s effective in delivering a good flow rate of hot water. It also minds the environment and your health. This unit releases little fumes. It’s also built to last long while serving you in the best way. On Amazon, it enjoys a warm welcome by customers. The great reviews by verified purchasers tell it all. Has an amazingly compact design and occupies a small space. The installation process is not hard. This appliance is light in weight thus easing transport and installation. It produces gases that are not friendly to the environment. Do you need a new water heater for your home? Perhaps your current heating system is struggling to keep up with the many hot water usages around your property. If someone is in the shower, while another member of the family is running hot water in the kitchen, you don’t want one source to drain the other. That’s exactly what can happen if you don’t have the right water heater for your property. If you’re on the market for a new water heater, you can consider the Takagi T-H3-DV-P Condensing High-Efficiency Propane Indoor Tankless Water Heater. Let’s take a look and see whether this system is up to the challenge in your household. This water heater is compact due to having no tank and can heat ten-gallons per minute. As well as this, the tank has computerized safety features, and this means there’s no pilot light to keep a check on. It’s a simple design to which means that once it’s set up, the water heater can be up, running and working in your home in a matter of minutes. Weighing just 63 pounds, it’s hard to be amazed at just how light and small this system actually is. It can also heat water at between 100 and 185 degrees Celsius, ensuring that your morning shower will be the perfect temperature. What about price? Compared to other heaters on the market that fit into the same category, this water heater seems to offer a fantastic value for money. It isn’t cheap, but considering the fact that it can give you hot water instantly, it may be a price worth paying. If you’re looking for a great instant water heater, this is the system for you. Set up correctly, the product will provide all your hot water needs in your home at the same time. There are a few advantages that this heater brings for you to consider. First, there’s the size, and since it’s so small, you won’t have any problem fitting it as part of the water system in your home. Then, there’s the sheer power of the product. You will have no problem running three showers or even filling up a jacuzzi with the amount of hot water that this system can provide. It can even keep up with the various appliances that you have around your property like the dishwasher and the washing machine. The temperature that you can set this at is both a pro and a con. On the one hand, people that love hot showers will adore this system and on the other setting anything above 120 degrees could be dangerous if young children are in the home. It’s also highly efficient. The water heater will only heat the level of water that you need. That means that you can save a fortune on energy because you won’t be using excess power to keep the water hot. While not a con per say, it is worth pointing out that the system requires a skilled plumber to fit it. While it is possible to fit it yourself, this will void the warranty of the product. As such, you do need to add a little extra onto the price for the installation. 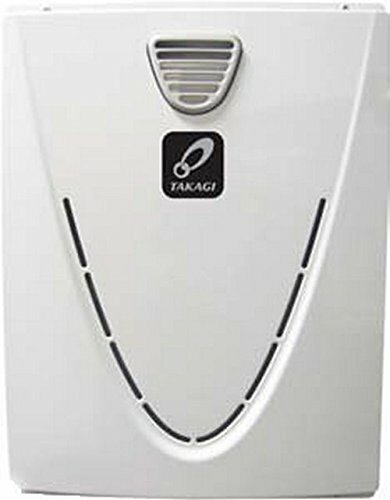 If you have used hot water systems before, then you must have come across the Takagi appliances. Takagi is a legendary brand with a long line-up of priceless hot water appliances. Over the years, Takagi Company has earned a reputation for their high-quality products. 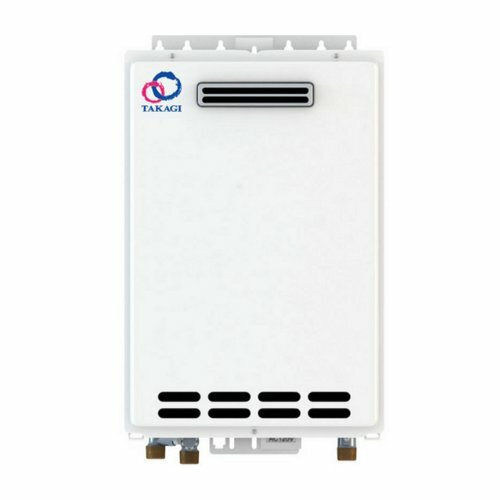 The Takagi T-T-KJr2-OS-LP Outdoor Tankless Water Heater is no difference. 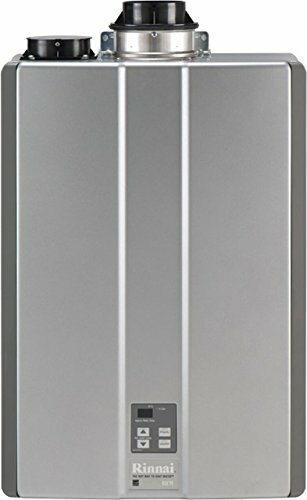 It’s one of the best propane tankless water heaters on the market so far. 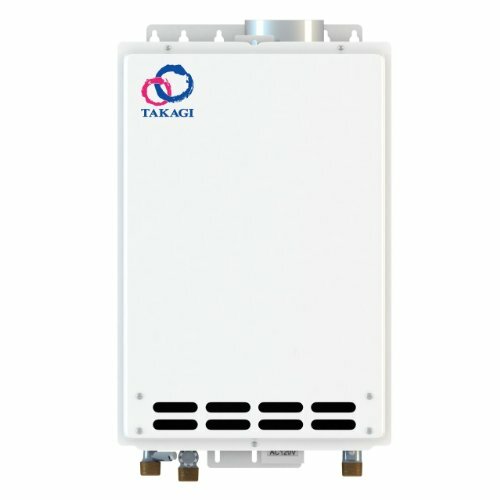 We love the fact that it’s the most compact in the Takagi line-up of tankless water heaters. If you own or dwell in a small residential unit, this unit matches you well. It’s built to work with radiant heating applications in light residential settings. Let’s dive in to analyze its features and performance. The Takagi T-T-KJr2-OS-LP Tankless Water Heater requires a 19,500 to 14,000 BTUs of power per hour. It can meet the hot water needs for small homes with up to two bathrooms. This unit offers a consistent hot water flow rate of up to 6.6 gallons per minute. This means that this unit provides better performance than most tanked water heaters. Its energy-saving capability is also worth appreciation. The Takagi T-T-KJr2-OS-LP Outdoor Tankless Water Heater boasts a 0.82 energy factor. So, it comes to bring down your monthly bills, who would not want it this way? Outdoor installation does not interfere with its durability. It features interior freeze protection. This feature ensures proper functioning and durability regardless of the climatic conditions. Among its valuable features is the air-fuel ratio sensor. With this element, this appliance has insignificant emissions. This has earned it a low NOx emission compliance certification. It also has various safety features that guarantee your safety as you use it. They include an overheat cutoff fuse, water, and exhaust temperature control function. We love its compact nature. This unit measures H 20.3″ * W 13.8″ * D 8.5″ and weighs only 33lb. This means, installing it in your limited space is possible. Keep in mind that it’s designed for outdoor installation. Even more, this unit supports wall mounting. So, you can free up your ground space to serve other purposes. We recommend this unit for use in small houses, apartments, and cottages. Ensure that it is installed by a professional. Otherwise, the warranty plan may not hold. We are confident that this unit will serve you with no disappointment whatsoever. It’s worth way far beyond its affordable price. It can serve two bathrooms at the same time. This makes it an excellent option for large homes. Saves on energy helping you reduce your monthly energy bill. It features an interior freeze protection making it work even during cold seasons. Functions well despite the climatic region. The power input required is rather high. Are you searching for the best propane water heater? Rinnai RUC98iP is a product to consider. Rinnai is a trusted brand with over 95 years of experience in the gas appliance field. Thus, nothing hinders the Rinnai Company from coming up with high-quality products. This manufacturer boasts certification by ISO 14001, ISO 9001, CSA, ANSI, LEED, and HERS. Let’s see what this Rinnai RUC98iP Ultra Series Propane Tankless Water Heater has. This water heater is one of the legendary products in this category. First, we appreciate the fact that its manufacturer provides two models for this unit. We have the one that utilizes natural gas (RU98IN) and also one that supports propane (RU981P). Again, you are free to install the PVC or concentric option of the propane tankless water heater. With these traits, this unit becomes ultra-versatile. The Rinnai RUC98iP will work with a power input of up to 199,000 BTUs. To your benefit, the power input is adjustable. As such, it’s able to deliver your preferred temperatures and flow rates. It provides a rare hot water flow rate of 9.8 gallons per minute. Regardless of the water temperatures, this unit is a convenient source of hot water. Its energy efficiency capability is also worth mentioning. It boasts an energy factor of 96%. So, upon installation, you will notice a significant change in your monthly bills. If you mind the environment, then the Rinnai RUC98iP Series Water Heater is a smart pick. It’s a unit that boasts ultra-low NOx emissions. You can be sure not to affect your surroundings with its use. Furthermore, installing the Rinnai RUC98iP is a breeze. All gratitude goes to its compact design and uncomplicated construction. It measures 10*18.5*26 inches. It’s important to mention that this unit best for indoor installation. It has a space-saving design. So, you can install it anywhere including your small office, home, or any other area. The Rinnai RUC98iP also scores well in its warranty offer. You get to enjoy a fantastic warranty plan for this unit. The Rinnai Company backs the heat exchanger for 12 years, the parts for 5 years and the labor for 2 years. With this warranty plan, you can now trust the Rinnai brand. You can be sure of the quality of this gas appliance. We recommend this unit. It has all it takes to serve your home or business in the best way. Get a professional to do the installation this way. The warranty will always remain valid. When installed well, your experience with the Rinnai RUC98iP will be disappointment free. Worth mentioning, this unit should need a professional to install. Only then is the warranty viable. It can produce 9.8 gallons per minute. Thus, expect High hot water flow rate. This gadget is environmentally friendly.